Place pesto ingredients into a food processor and pulse until you reach your desired consistency. In a large bowl, toss Tri-Color Salad Ready Tomato Wedges (drained) with red pepper flakes, garlic, and salt and peper, and set aside. Bring a large pot of lightly salted water to boil; cook pasta until “al dente”. Drain pasta; return to pot. 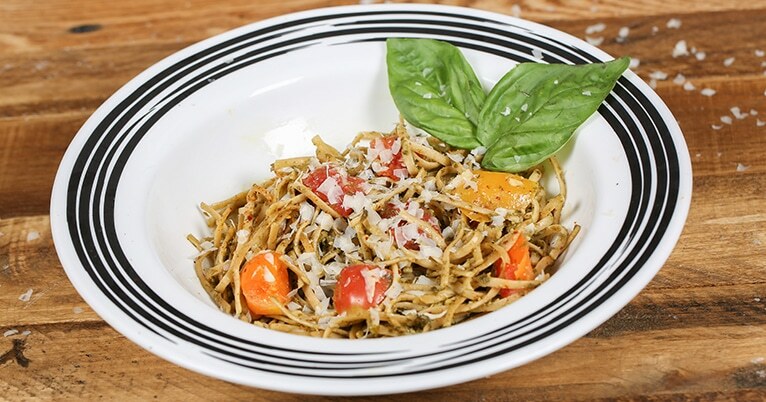 Add pesto and tomatoes and toss with hot pasta over medium high heat until piping hot. Serve, topping with grated cheese as desired. Enjoy!